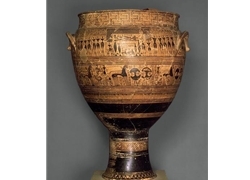 Large Funerary vessels were made between 900 and 700 BCE as grave markers. On the funerary, there is a pictorial record of the burial ritual that was performed. There is great detail depicted on the vessel. The body is placed at the top of the vessel lying on the side ready to be cremated. There are people standing on each side with their arms over their head to imply the gesture of anguish and mourning. In this vessel, there are horse-drawn chariot and foot-soldiers who with their defined physical appearance, move in a glum procession. The shields can be a representation of a military person, or represent a very important person. There are geometric figures used to represent humans in the picture. There are triangles used for torsos and head, round dots for the eyes, long and thin rectangles for the arms. The figures have tiny waists. Three dimensional form illusions taking over real space have been avoided. There is a rhythm of repeated features on the vessel to create a deep sense of human loss to many. The Grecian dead enter an area of mystery and obscurity that a living human can not define. For the first time in Greek art, specific artists can be identified by their style and technique. This funerary vessel, also from the Dipylon cemetery, was also painted by the so-called Dipylon Painter, and shows a prothesis scene. In the second level, a procession of chariots and warriors has been added - note the shape of the warriors' shields. This shape, which preceded the round hoplite shield and was made of layered animal hides, is known as a cut-out shield, and was the type described in the Iliad as the type used by the Homeric heroes.